Are the days of doctor house calls poised to come back? Now that we have sophisticated, high-speed data networks and readily available technology to facilitate telehealth for “virtual” house calls, more healthcare providers are starting to deploy telemedicine in an effort to provide better care outside of the traditional setting (hospital, doctor’s office, clinic and so on). Your nurses out in the field are able to work with telehealth services to follow up with patients more readily than would occur if the patients had to come to see you instead of you visiting them. When it comes to addressing patient needs in post-acute settings, you and fellow stakeholders in your medical organization naturally will have a vested interest in promoting better patient engagement. Improved engagement can lead to better outcomes in patient health as well as for your organization’s bottom line. This is because the Centers for Medicare & Medicaid Services provides reimbursements for providers using telemedicine, as long as they adhere to standards for efficiency and quality of care and are doing the work as economically as possible. However, you may have been avoiding implementing telehealth services so far because of concerns about adhering to patient care standards while still ensuring there is robust security to safeguard each patient’s protected health information or PHI. Whether you are a Chief Medical Officer, Chief Nursing Officer or serve as a Chief Information Officer, it’s in your best interest to ensure that the nurses who will be working out in the field in post-acute environments can follow best practices for telehealth services. This could be for home health, hospice or other medical services that are well suited for distance medicine facilitated with phone calls, data transmissions from sensors, video chats and text messaging. Medicaid regards telemedicine “as a cost-effective alternative to the more traditional face-to-face way of providing medical care (e.g., face-to-face consultations or examinations between provider and patient).” Indeed, telehealth is designed to allow interactive patient communication using audio and video equipment to allow for real-time, two-way conversations. However, telemedicine does not consist of simply using ordinary phones or video cameras, because of privacy concerns. You need to communicate using robust security. Otherwise, criminal hackers could obtain sensitive PHI and use this information to drain patient bank accounts, steal their identities and commit fraud. What’s also needed is a way to do secure texting. Just like you must guard the details in patients’ medical records from unauthorized access, the content of each text message must also remain confidential. Deliver surveys on a regular basis to check engagement. How will you know what patients are thinking and feeling if you don’t ask? Capture vitals in a timely fashion, including data from pulse oximetery, heart and breath rate and temperature, as well as wireless glucose meters and weight scales. 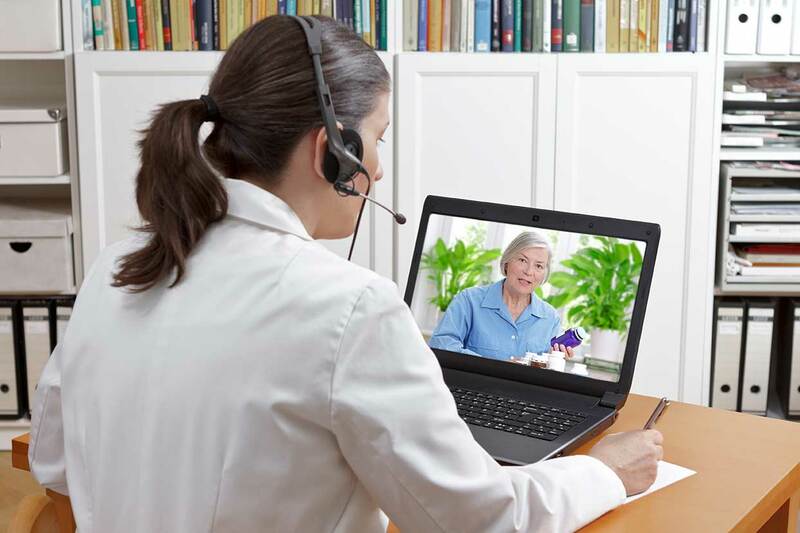 Fast and convenient “follow-up” visits through video conferencing to address a slew of new and complex questions that arise at home after the patient’s discharge. Provide ongoing patient education, such as videos for self-care in between visits from the healthcare provider. Before making a presentation to your fellow stakeholders about telehealth, it pays to become more acquainted with developing trends. Data analytics and collecting patient data automatically is predicted to increase in 2018 and beyond, according to a report from the Arizona Telemedicine Program. This is accomplished with sensors for patient self-monitoring, such as for ECGs along with smartphone apps. About 65% of interactions in 2018 will take place using mobile devices. Rural communities with limited access to local healthcare providers are now experiencing patients using the latest smartphones with high-resolution cameras to transmit clear images to physicians. But telehealth isn’t seen just as benefiting patients in remote locations. It is also being touted as more convenient: “More options exist today for the end user to experience home delivery services in the form of internet-enabled devices to handle basic things such as blood pressure, pulse oximetry, glucose, and heartbeat,” according to a report from Healthcare Tech Outlook. When preparing to implement telehealth services, you should carry out a review of the ways you currently store and access PHI, as you will need to be in compliance with Health Insurance Portability and Accountability Act or HIPAA privacy standards. CMS has granted states the power to develop their own Medicaid telehealth policies, which means that your organization will need to verify the rules for each location where you provide services. For private payers, you’ll need to check whether you will be reimbursed at the same rate for services as if you had conducted them in-house, according to the National Consortium of Telehealth Resource Centers. In order to be reimbursed for telehealth services from CMS, you have to demonstrate that you provide a minimum level of quality of care, economy and efficiency. Keep in mind that each provider on your team must be licensed to practice medicine in each state where you do telehealth. So treating patients across state lines will involve multiple licenses for doctors and nurses. Clearly there are a lot of considerations for boosting patient engagement, especially in post-acute settings. If you are so busy with current duties that you lack the time to become more familiar with telehealth issues or if you are still on the fence about implementing a telehealth solution in your organization, we are standing by to consult with you. Click Here to learn more about QliqSOFT and Telehealth.